Whatever the size of your kitchen, you’ll need an extractor to keep the room odour- and grease-free, and to stop it becoming damp from excess condensation. There are plenty of designs to tickle the taste buds – from telescopic and canopy models to island and downdraft varieties – but some are better suited to particular sizes and shapes of kitchens. How do you work out what’s best for your home? Start with our guide to the most popular styles. 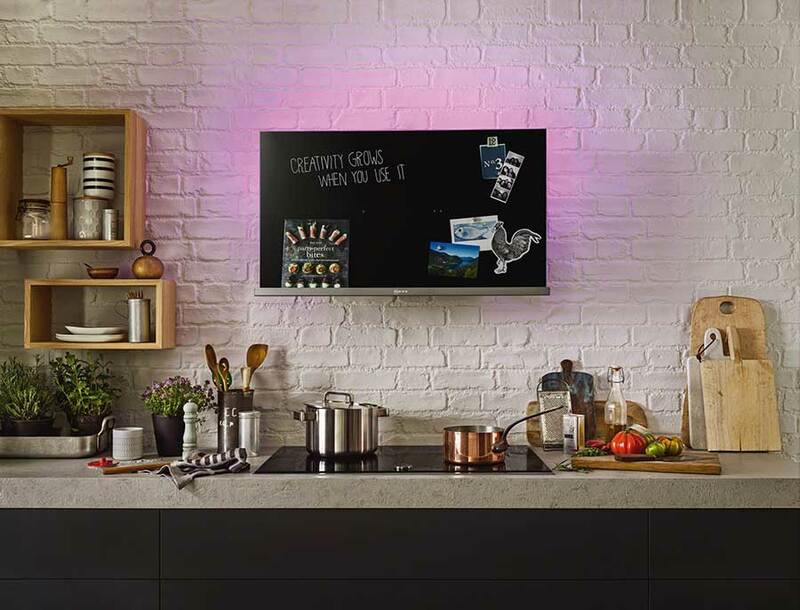 Neff‘s Creative Slimline hood features a magnetic surface for attaching recipes and shopping lists. Priced around £799, it is not suitable for gas hobs. Affordable and discrete, an integrated extractor slots neatly between two existing wall units and is covered by a cabinet door that is pulled out when you want to activate extraction. On the downside, an integrated extractor may not offer as much coverage as other designs since it’s built into a cabinet, which is typically shallower than the worktop beneath. The Siemens iQ100 LE66MAC00B integrated cooker hood boasts an extraction rate of 620 m3/h and costs from as little as £229. If you want more coverage, a telescopic extractor is a good alternative. Available at a range of price points, it extends when needed but slides neatly away when not in use. Pull out the Bosch Serie 8 DFS097J50B telescopic cooker hood to start extraction. Seen in brushed steel, it is priced around £949. 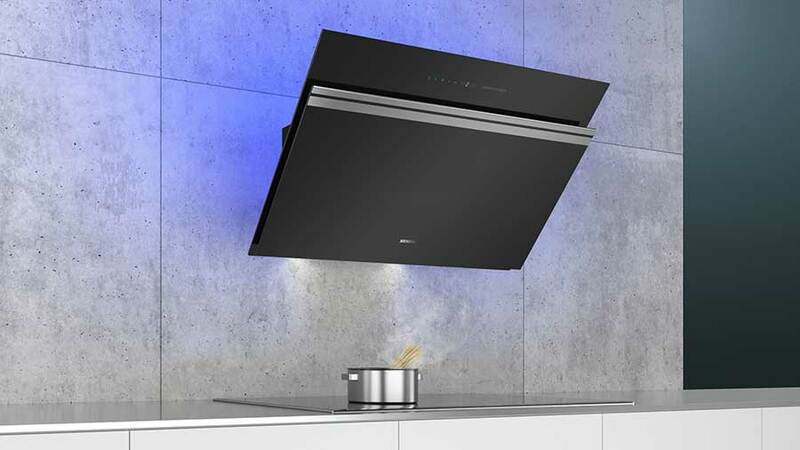 A chimney extractor is an inverted T-shape mounted on the wall above a hob. Other wall-mounted designs might be more aesthetically pleasing, but there’s still a market for the traditional chimney style, not least because it offers a large canopy area in comparison to other designs. 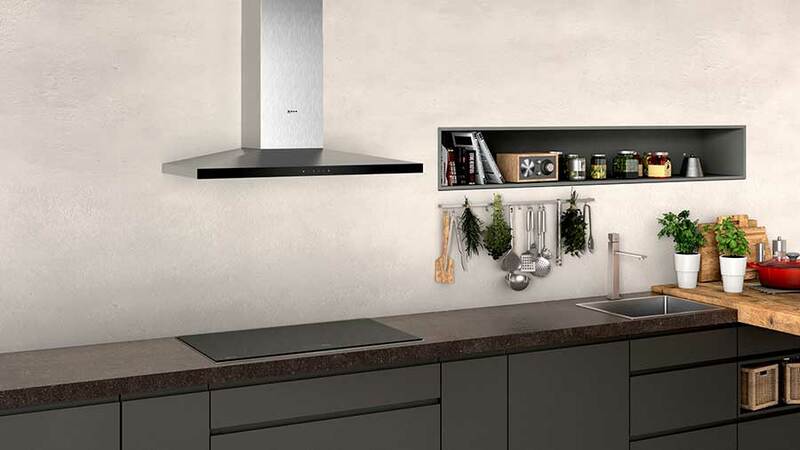 If your kitchen is small or you want something more stylish, shop for an angled wall-mounted design that is less intrusive than a chimney hood (see below). A classic design with a modern twist, the Neff N 50 D94QFM1N0B Slim Pyramid chimney hood is reasonably priced from around £549. Canopy hoods are good for small spaces as they fit onto the underside of the cabinets above the hob. Unlike telescopic hoods, which need to be pulled out of the cabinet before use, canopy hoods are ready for action without any movement or reconfiguration. They are also great for people who want a minimalist look as the extractor doesn’t intrude on the kitchen design. 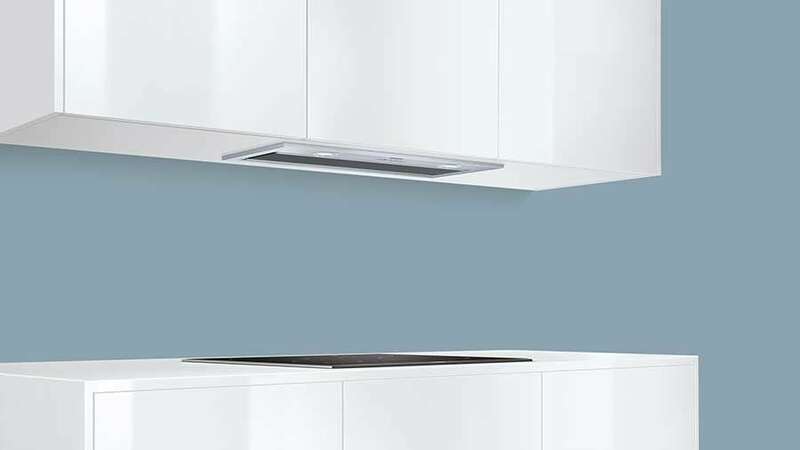 Siemens iQ700 LB79585GB canopy cooker hood has an extraction rate of 770 m3/h, which can be temporarily increased by selecting the intensive setting. Priced around £829. If your hob is located on an island or peninsula unit, a ceiling-mounted extractor is a practical solution. It’s also likely to be an attractive one: since ceiling extractors are so visible, manufacturers are now producing decorative designs that balance function and style. If you’d prefer something less conspicuous, you could opt for an extractor built directly into the ceiling. This will preserve the sightlines in the room – important if you have a garden view. However, this option isn’t suitable for all layouts: you may find that the motor of the hood is too large for the ceiling space or the gap between the hob and the ceiling is too big. Once the distance from hob to hood passes 130cm, the grease particles become too heavy to remove and drop back down into the kitchen, making the hood ineffective. In both cases, the solution is a bulkhead to house the extractor. This can be expensive and obtrusive – not always ideal if you want a hood that blends in. 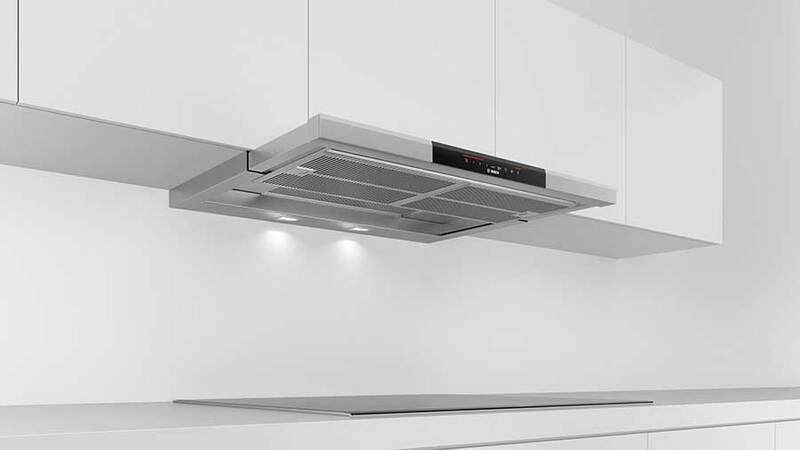 The eye-catching cube design of the Bosch DII31RV60 ceiling mounted cooker hood has a sleek back finish. Priced around £1,109. 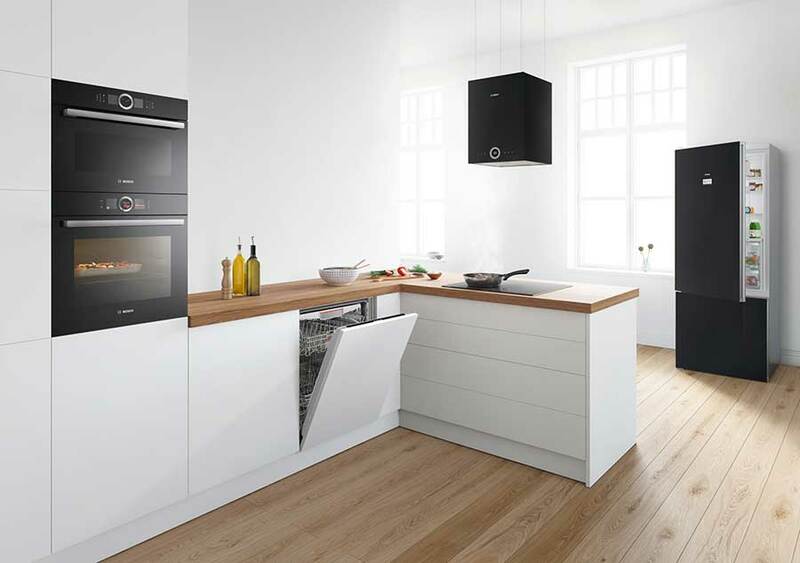 Being located so close to the cooking action, downdrafts have the advantage of powerful localised extraction that quickly removes cooking odours and condensation before they have chance to rise and permeate the kitchen. You’ll need to consider whether you’re willing to sacrifice some cabinet space to accommodate the mechanics of this kind of extractor. Plus, if you want to locate a downdraft on an island, you’ll need to plan for the ducting channel, which will run under the floor. 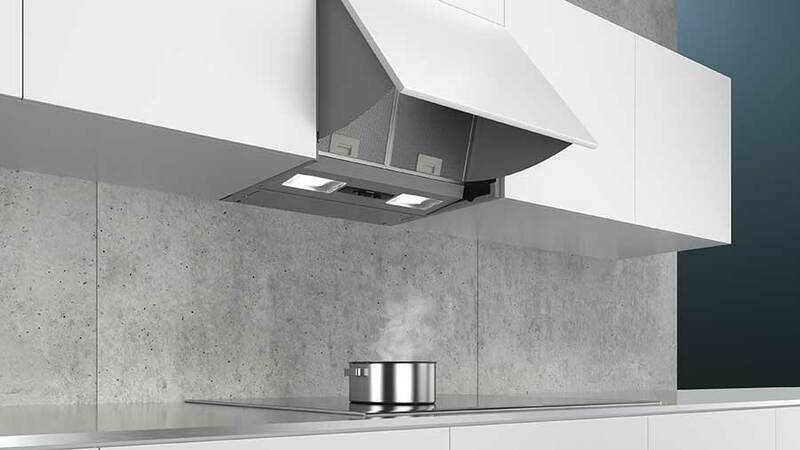 Read expert advice on installing a downdraft extractor. 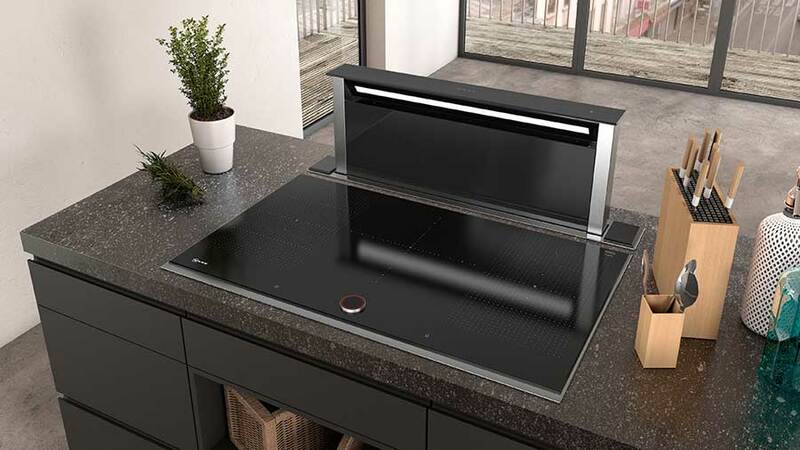 Ideal for installing on islands, the Neff D95DAP8N0B Downdraft Hood makes the perfect statement piece, sitting flush with the worktop when not in use and rising up to a height of 30cm when required. As an alternative to a downdraft extractor, consider a venting hob that combines the power of two appliances (see below). Not only does this eliminate the need to have both a hob and a hood in your kitchen, but is also great fro space-saving and look good too. 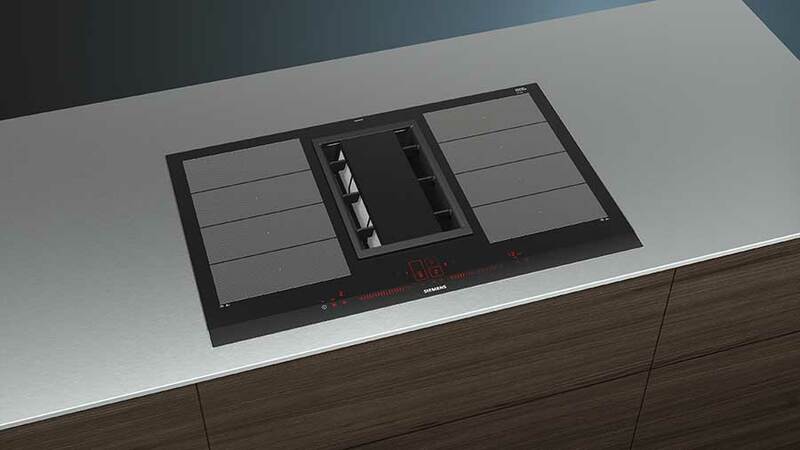 Siemens’ EX875LX34E inductionAir Venting Cooktop combines flexible induction zones and powerful extraction to efficiently deal with cooking odours and steam. Priced around £3,239. With open-plan spaces becoming ever more popular, appliance manufacturers are competing to create effective and easy-to-use extractors. Technology is the battleground: motors are becoming more powerful, and some manufacturers are creating app-controlled smart models like the Siemens extractor below. The highlight of Siemens’ iQ700 LC97FVW60B Flat hood is the Home Connect function that allows you to connect to your appliance via the Home Connect app no matter where you are. Priced around £1,119. Don’t waste money on an extractor that doesn’t remove heat and smells effectively. Read our expert advice on getting a breath of fresh air in your kitchen.